Background: Argireline is an innovative neuropeptide widely applied topically on the skin. 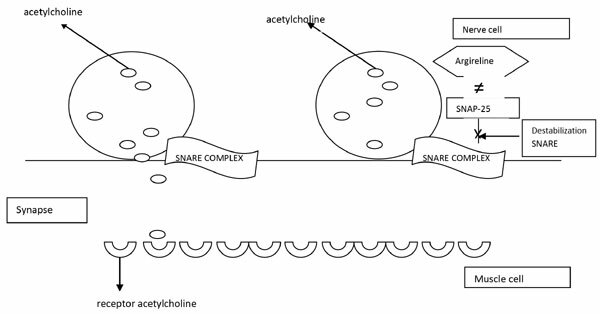 Its structure resembles the N-terminal end of the synaptic protein SNAP-25, and so inhibits the formation of SNARE complex and reduces the release of the neurotransmitter acetylcholine. These properties are used in cosmetic formulations to reduce facial muscle contractions, thus preventing the formation of expressive wrinkles, mainly on the forehead and around eyes. Methodology: Argireline is a biomimetic peptide whose effect has been confirmed. When used at a concentration of 5-10%, its therapeutic activity is similar to that of botulinum toxin but without its side effects. This biologically-active ingredient is used for daily home care (good penetration of emulsion W/O/W) and in beauty salons to facilitate penetration of peptides through the skin (dermarollery, iontophoresis). Conclusion: The article presents recent data concerning the value of argireline as a highly important synthetic molecule which affects the mechanical properties of the skin. Keywords: Argireline, hexapeptide, mimic wrinkles, SNARE complex, botulinum toxin, skin. Keywords:Argireline, hexapeptide, mimic wrinkles, SNARE complex, botulinum toxin, skin. Abstract:Background: Argireline is an innovative neuropeptide widely applied topically on the skin. Its structure resembles the N-terminal end of the synaptic protein SNAP-25, and so inhibits the formation of SNARE complex and reduces the release of the neurotransmitter acetylcholine. These properties are used in cosmetic formulations to reduce facial muscle contractions, thus preventing the formation of expressive wrinkles, mainly on the forehead and around eyes.